Beautiful family home ! This 1300 sq. 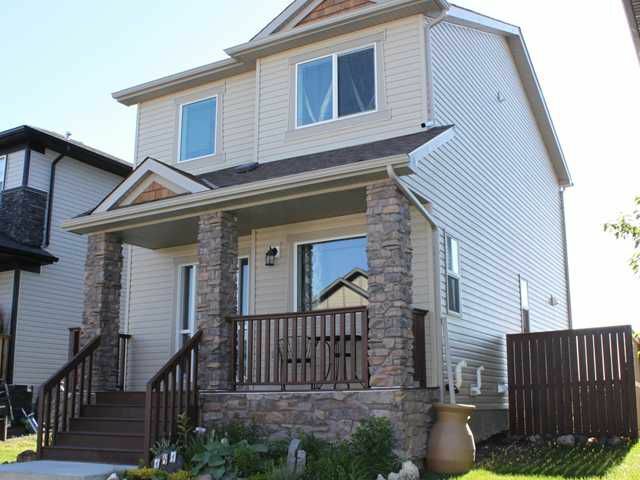 ft., 3 bedroom, 2 storey located in the community of Drake Landing shouldn't be missed. The main floor features a large living room ( WITH GAS FIREPLACE & HARDWOOD FLOORING ), huge country kitchen ( WITH GRANITE COUNTERTOPS & SOLID WOOD CABINETS ), breakfast nook ( WITH ACCESS TO THE REAR DECK ) and a 2 pc bath all under 9 ft. ceilings. Upstairs you'll find 3 bedrooms, including the master suite ( WITH A 3 PC. ENSUITE & WALKIN CLOSET ) along with a family 4 pc. bath and upstairs laundry. The basement is undeveloped ( WITH ROUGH IN ) and awaiting your ideas. Outside you'll find a large, fenced yard with big rear deck. Don't delay....call today ! !